Unless otherwise required by law or as expressly provided herein, ACER will not entertain any challenges of or requests or demands to review HPAT – Ireland test results or any determination by it that any misconduct has occurred or in relation to any consequences imposed by ACER following a determination that misconduct has occurred. Nor is it possible to give special consideration for impaired performance on the day of the test caused by illness or unexpected personal situations. Any complaints relating to the test venue or physical discomfort suffered should be reported immediately to the supervisor on the day, and in writing to the HPAT – Ireland Office within seven days of the test administration. 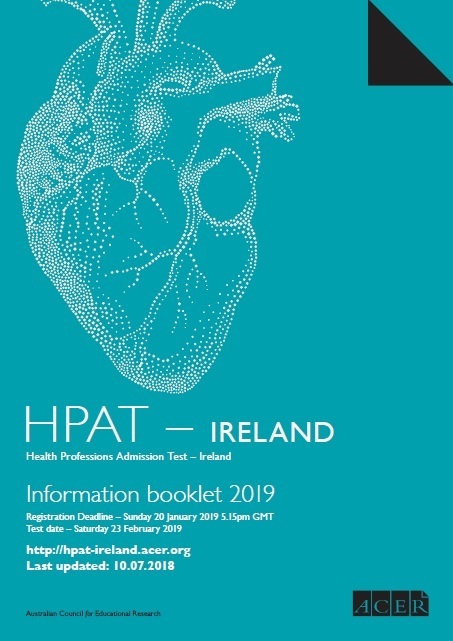 You are advised that HPAT – Ireland results are released only after careful calculation and extensive checking, and errors in scoring are highly unlikely. However, following receipt of the HPAT – Ireland Statement of Results, you may apply for a re-check of your answer sheet, if you believe an error may have been made. A re-check involves individual rescoring of the answer sheet. The resulting scores will then be compared with the original scores to check that there has been no error in calculating or collating marks. Requests for re-checks for UL applicants and mature candidates must be made through the online account within one week from the release of results in mid to late April. Requests for re-checks for other candidates must be submitted through the online account by midnight GMT 5 July 2019. A fee of €85 is payable for this service. Payment is by credit card only. In the unlikely case of a scoring error being found, the re-check fee will be refunded and you, the CAO and the universities will be notified. All re-checks will be processed after the relevant deadline and you will be notified of the outcome shortly after. NOTE: Re-checks for the Written English component are not offered.